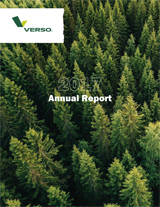 Verso Corporation is the turn-to company for those looking to successfully navigate the complexities of paper sourcing and performance. A leading North American producer of specialty and graphic papers, packaging and pulp, Verso provides insightful solutions that help drive improved customer efficiency, productivity, brand awareness and business results. Verso’s long-standing reputation for quality and reliability is directly tied to our vision to be a company with passion that is respected and trusted by all. Verso’s passion is rooted in ethical business practices that demand safe workplaces for our employees and sustainable wood sourcing for our products. This passion, combined with our flexible manufacturing capabilities and an unmatched commitment to product performance, delivery and service, make Verso a preferred choice among commercial printers, paper merchants and brokers, converters, publishers and other end users.